Pacific Blue have increased their Brisbane-Chirstchurch return flights to 11x weekly up from 10, with the introduction of DJ80/81 0935-1600 /1645-1735. This brings the number of flights back to that previously operated, before the sunday morning flight was dropped to allow more flights from Christchurch to Melbourne. 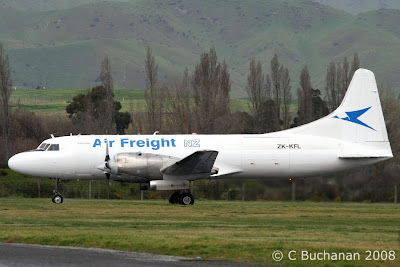 The first of these was operated on Saturday 20-Dec-2008 by ZK-PBK Maiden New Zealand. With the introduction of this service, the fleet of 10 aircraft is now fully utalised at all times, during the weekend. This is for the first time since the introduction of the 10th frame to the fleet at the beginning of November. Christmas and the New Year are upon us and I will be taking a well deserved break over the holiday period, but will be back in the new year. So to all the followers of this blog a big Thank you for supporting the blog in 2008, and I hope to see you all again in 2009. Pacific Blue have increased their Brisbane-Nadi return flights to 9x weekly, up from daily, with the addition of a Friday and Sunday evening flight. DJ175 departs Brisbane at 1810 and arrives in Nadi at 2350. The flight overnights before returning to Brisbane as DJ174, departing Nadi at 0705 Saturday and 0630 Monday, arriving into Brisbane at 0915 and 0840 respectively. All times local. The first of the new DJ175 flights operated tonight Friday 19-Dec-2008 with the honours going to ZK-PBI Lady Rebecca. 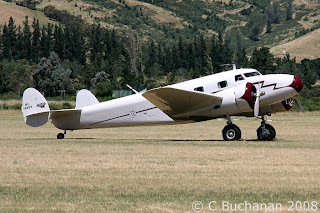 Arriving into Woodbourne from Ohakea was RNZAF B200 King Air NZ1881, after a short stay it departed for Christchurch. Fellow King Air NZ1884 was also heard heading to Christchurch. The Sydney-Wellington 73H service QF117/48 has concluded, with the service reverting back to the regular Jetconnect 734. It was initially supposed to conclude on Tuesday 16-Dec-2008, but the final service was QF117 on Wednesday 17-Dec-2008. From 8-14 Dec the service was operated by VH-VXA, from 15-17 Dec the service was operated by VH-VXL. VXL then positioned back to Sydney on Thursday 18-Dec-2008 as QF6038. Air National took delivery of BAe 146-200 C-GRNX on Monday 15-Dec-2008, with the aircraft arriving from Anchorage with stops in Adak, Midway Island, Honolulu, Christmas Island, Apia and Tonga. It is expected that the 146 will take up registration ZK-ECO. 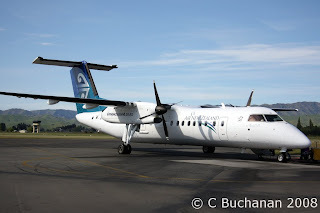 With the arrival of ECO the Air National airline fleet is now 6, joining BAe J32EP's ZK-ECI, J, N, P, R.
The J32s operate in the Air New Zealand Link network, although it is expected ECO will not operate for Air New Zealand, but remain as an Air National charter aircraft. Air Nationals fleet also consits of Piper PA-23-250 ZK-ECM, and they operate the following corporate jets on behalf of their owners, Gulfstream G200 ZK-RGB, Gulfstream GIV ZK-KFB and Westwind II ZK-RML. They also have helicopters available. Vincent Aviation's New Zealand fleet currently consists of the following aircraft, Beech 1900D ZK-VAB, Dash 8-100 ZK-VAC, Beech 1900C ZK-VAE and Reims/Cessna F406 ZK-VAF. The 2 1900s and the Dash 8 had been operated in the Air New Zealand Link network, but this contract has now ended, and the F406 was operating for Civil Aviation in an airfield calibration role. ZK-VAF was noted departing Auckland on 23-Oct-2008 heading to Norfolk Island, before being noted in Noumea, Honiara and Port Vila. I can't find any record of VAF returning form this trip, and it is rumoured that VAF has been sold. 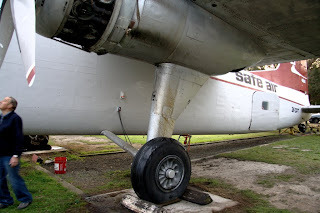 A former Origin Pacific J31 has undergone maintenance and a repaint in preperation to operate for Vincent, believed to be in the airfield calibration role. It is believed to be ZK-JSH, although work has been noted on at least 2 of the 3 J31s. 1900C ZK-VAE departed Auckland for Norfolk Island and Brisbane on 04-Sept-2008 bound for Myanmar on a six month contract. It is not know if VAE will return to NZ or head for Vincent's Darwin base, at the completion of the contract. 1900D ZK-VAB is possibly also heading for the Darwin base, but this is unconfirmed, as it is required at the Wellington base for a few charters in the new year, and may remain in Wellington for charter work. Dash-8-102 ZK-VAC has been reported as heading for a contract in either Vanuatu or Darwin, but this also needs to be confirmed. It has been noted as missing from the Wellington base for a while, but I have not found any noting of it leaving the country. 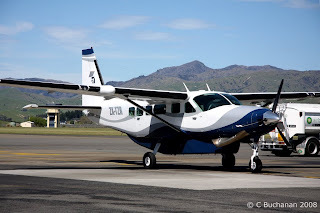 A day of medical transfers with Christchurch based New Zealand Flying Doctors Service C441 ZK-NFD operating CHC-BHE-CHC and Wellington based Life Flight Trust Metroliner III ZK-LFT operating WLG-BHE-WLG. 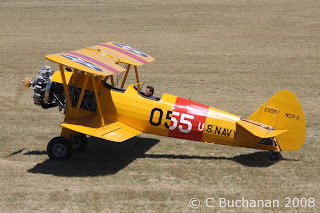 College 47 a training aircraft from Motueka based Nelson Aviation College operated in the Marlbourough region including a touch and go at Woodbourne. Noted passing overhead Marlborough was Piper PA-31 ZK-MJF of Helicopter Services (BOP) Ltd flying from Christchurch to Taupo. The rest of the day was dominated by the RNZAF. 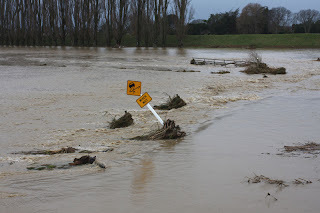 Airtrainers were prevelent with NZ1987, NZ1992, and NZ1993 operating in the Marlborough region from Woodbourne. They were noted doing aerobatics just off the coast of Blenheim in Cloudy Bay. NZ1993 was also noted transmitting the following code DFLSPRL. Arriving into Woodbourne from Ohakea was Iroquoi NZ3806. 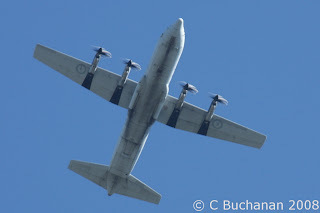 Also arriving during the afternoon was an unknown C-130 Hercules. Arriving between 0700 and 0800 was Life Flight Trust Metroiner III ZK-LFT. The mid afternoon slience was shattered with the low, fast pass over Blenheim of Auckland based Aero L-29 ZK-VAU. VAU had arrived from parts north and was heading for parts South. Photos of the Woodbourne stop can be found on Gavin's blog HERE. As mentioned on an earlier enttry, the AKL-MEL and AKL-RAR flights have increased services. The first AKL-MEL friday afternoon flight on 5-December-08 was operated by ZK-PBM Kiwi Ana which also operated the first Saturday afternoon service on 6-December-08. This takes AKL-MEL return to 9x weekly. The first of the new Sunday afternoon services to Rarotonga on 7-December-08 was operated by ZK-PBG Bewitching Broome. This takes AKL-RAR return to 3x weekly. The new MEL-WLG-MEL routed, 73H operated, late afternoon arrival, early evening departure, QF37/38, began yesterday. This previously operated as QF38/37 WLG-MEL-WLG with a mix of 733 and 734s and morning and afternoon departures. The first flight was operated yesterday 8-December-08 with Qantas 73H VH-VZC Innisfail, operated by Jetconnect. Yesterday there was also a change in the double daily QF118/47 and QF48/117 services WLG-SYD-WLG. 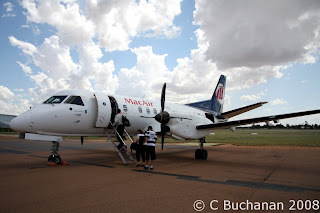 QF118 was cancelled and QF47/48/117 was operated by VH-VXA Broome. It has been noted that the 73H will continue to operate on the 48/117 service until 16-December-08 with 118/47 remaining as a mix of 733 & 734 aircraft, with the exception of the two weekend services which will also operate with 73H. A busy day for medical flights today in Marlborough. Rushing to the Seddon scene of a car accident were 2 rescue helicopters. Wellington based Westpac Rescue BK-117 ZK-HLF and Nelson based Summit Rescue AS 350BA ZK-HQT both then transported the seriously injured to Wairau hospital here in Blenheim. Noted flying over Marlborough this morning was Glufstream G450 N851GG. 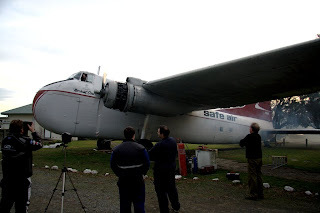 This was departing NZ from Christchurch heading to Nadi Fiji. N851GG arrived in the country on 01-Dec-08 into Auckland from Sydney, on 04-Dec-08 it flew from Auckland to Wellington and yesterday 07-Dec-08 it flew to Christchurch. 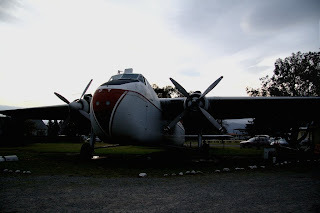 The aircraft carried singers John Mellencamp and Sheryl Crowe on their 3 stop NZ tour. National Business Review Cessna 501 Citation N800DT passed over Marlborough on an Ardmore - Christchurch - Ardmore flight. Arriving into Woodbourne during the morning was RNZAF KingAir NZ1881 from Ohakea. This morning 3rd December Marlborough Helicopters Robinson R22 Beta ZK-HWF c/n3612 rolled over upon landing. The R22 had been undertaking a Possum operation, involving dropping possum bait stations on hilly country in the Awatere Valley. It was attempting to land on uneven ground near the Black Birch stream when the roll over occured. 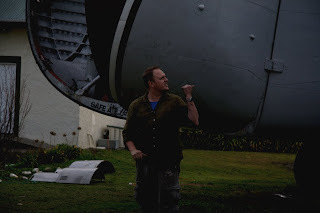 The two occupants were unhurt and another helicopter returned them to Marlborough Helicopters Omaka base, before the Summit Rescue Helicopter (Aerospatiale AS 350BA ZK-HQT) was called in to retrieve the emergancy beacon from the helicopter. 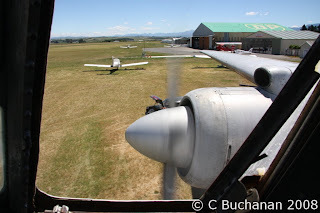 The radial engines were roaring at Omaka today with 6 engines in total out in the sunshine 5 of which roared with life. The first service departed last night Monday 1 December and was operated by ZK-PBF. It was nice to see the Polynesian Blue liveried plane operate the 1st flight of this new Polynesian Blue service. The first service departed this morning Tuesday 2 December and was operated by ZK-PBG. The first of the additional summer services to Wellington departed tonight Tuesday 2 December and was operated by ZK-PBK. This route has been increased to daily with the addition of a new Monday service first operated yesterday Monday 1 December by ZK-PBG. The Tuesday service has also changed from a morning to an afternoon departure. This route has also changed departure time on Tuesday, swapping from afternoon to morning. The first new timed service operated today Tuesday 2 December with ZK-PBA. This route now operates 3x weekly with the addition of a Sunday service, the first of which will depart on Sunday 7 December. Brisbane to Auckland increased to 11x weekly with the addition of a Wednesday morning flight which began on the 24th September and was operated by ZK-PBG. This has increased from 3 to 5x weekly with the addition of Tuesday and Sunday flights. The Tuesday flights began on 7 October with ZK-PBD operating the flight, while the Sunday flight began on 5 December with the flight being operated by ZK-PBA. The Sunday CHC-MEL-CHC flight replaced a CHC-BNE-CHC flight. Qantas Jetconnect are about to undergo some serious changes. From 6 December they reduce by up to 8 flights a day. They then reduce by another 2-4 flights per day from 17 Jan 09. Jetconnect operate International flights from Wellington and also Auckland. From Nov 11 QF116/115 AKL-BNE-AKL and QF134/133 AKL-MEL-AKL which is normally operated by a QF 738 is now operated by a Jetconnect 734 with ZK-JTP operating QF116/115 and then QF134/133 was operated by ZK-JTR this will return to the Qantas 738 around March. WLG-BNE-WLG flights QF58/57 operate on Saturday and Sundays, currently the Saturday flight is an afternoon/night flight, while the Sunday flight is a morning flight. 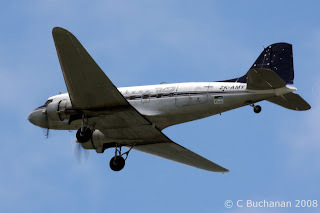 From this weekend 6/7 December the flight will be in the afternoon both days. WLG-MEL-WLG flights QF38/37 operate daily using a mix of Jetconnect B733/4 aircraft. Tu, F, Sa morning flights and M, W, Th, Su afternoon/evening flights. From this weekend they change. Weekend flights will operate in the morning WLG-MEL-WLG using Jetconnect 733/4s. Weekday flights from Monday 8 December will now operate during the middle of the day MEL-WLG-MEL using QF738s operated by Jetconnect. The scope of this blog is about to change slightly. 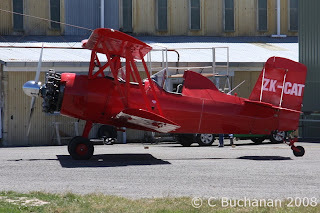 Since I started this blog earlier this year I have focused solely on the Marlborough Aviation scene, and also movements noted in the central New Zealand area. 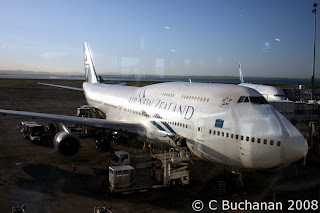 While this has been great I feel its now time to add some more of what Im interested in, with the introduction of news related to New Zealand based airlines. 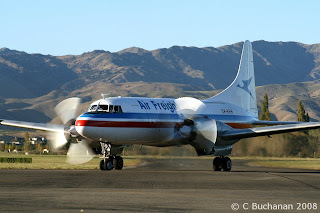 Pionair Aviation Convair VH-PAL on a tourist flight. PAL either originated or departed to Wellington, as it was noticed there during the day. This is believed to be the first visit of PAL to Woodbourne since its shift from the New Zealand register to the Australian register. 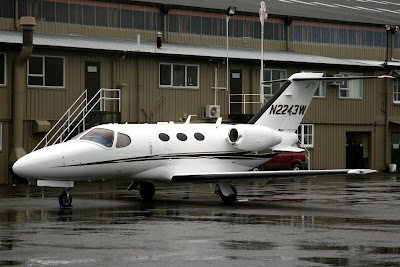 Cessna Citation Mustang ZK-MUS arrived into Woodbourne around 1730local from Dunedin. 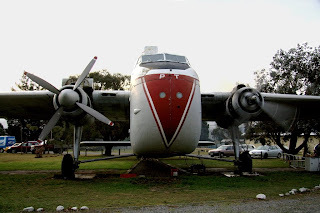 It is believed it returned to its Wellington home base VFR. 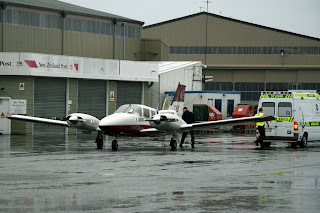 CTC Diamond DA-42 Twin Star ZK-CTI arrived from Wellington before continuing to Nelson. This was part of a cross country flight that routed Hamilton-Wellington-Woodbourne-Nelson-Palmerston North-Hamilton. There has been steady RNZAF activity in the time frame with several Beech King Air arrival and departures. There have also been several Airtrainer arrival and departures and at least one C130 Hercules arrival and departure. 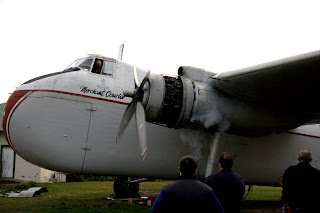 Some more photos taken yeasterday as ZK-CPT came back to life for the first time since 1986.